One of the interesting problems about reverse-engineering code is the rather strange transitions and optimizing compiler can do. Perhaps one of the strangest transformations is the optimization of division by a compile-time constant integer. Because integer division is one of the slowest operations in the computer, the performance is tremendously improved if the division can be done by other means. The simplest solution comes about when the divisor is a power of 2, because then it can be done by a shift (but this is not quite right in general, and doesn't work for signed division without special provision, more on this later). But you can also optimize division by any other integer divisor by computing a multiplier and shift value to perform the actual division. While normally there is no advantage to computing this value at runtime, if you are about to do a tight, intense computation where you don't have a compile time constant divisor, it will make the runtime loop run substantially faster (perhaps an order of magnitude to a factor of 50). The file magic.cpp in the downloadable project contains this algorithm, so you can easily incorporate it into your project. The value a is referred to in this essay as the multiplicative inverse. Typing the divisor into the top left box computes the multiplier and sar instruction value. Typing the multiplier found it a piece of code, as an 8-digit hex number, into the lower left box, and giving the sar value, will reveal the original divisor. Note that these are automatically filled in when the divisor is typed into the top left box. After the imul instruction, the result of eax * 0x4ec4ec4f is found in edx:eax. The remaining three instructions deal with keeping the value correct if the dividend is negative. The value will be one too high if the result is negative; therefore, the value is adjusted by 1 if it is negative. This is done by shifting the quotient (edx) right by 31 bits using a logical shift right (shr instruction). The result is 0 if the value is positive and 1 if the value is negative. By doing the add instruction, the quotient is adjusted according to the sign bit, and left in eax. Division in signed or unsigned arithmetic is available. Note that in some cases, the multiplicative inverse is identical in both signed and unsigned arithmetic; in other cases, it can be quite different. Clicking the copy button ( ) will place the entire contents of the edit control to the clipboard. where the high-order value has 32 bits and represents the integer, and the low-order 32 bits represents the fraction, and the bits are interpreted as inverse powers of 2. Unlike a floating point number, the number is not represented with a "hidden" implicit 1=bit. The divisor is normalized to a 4-bit normalization, and the shift constant sh derived in the formula above is the additional factor to be used to compensate for the normalization. The inverter program computes the low-order 32-bit value of the number expressed in the above formula, becaue the integer part is always treated as being 0. Division of an integer by a power of 2 is trivial; just shift right. To divide by 2n, shift right n bits. Well, only if the integer is positive. As we saw above, there has to be code to compensate for the sign bit. For example, to divide by 4, you would think that a sar 2 would do the job. But in signed arithmetic, it doesn't. The dividend is placed in the eax register. It is then sign-extended into the edx register by the cdq instruction. The value 2n-1 is computed as a bit mask, and the low-order bits of the sign extension are masked off. This produces a "rounding" value which is either 0 or a sequence of 1-bits equal in length to the shift distance. This value is added to eax and then the shift by n bits to do the division by 2n. To simplify the discussion, we will show only the low-order 8 bits, where the high-order bit is the sign bit. The values are 2's complement. So if I show 1110 1001, the actual value was 1111 1111 1111 1111 1111 1111 1110 1001. The computation shown here is -23/4, which should be -5. Suppose I do 23/4; the expected result is 5. We fix this by adding the three instructions shown; one to get the sign value, two more trivial ones to do the rounding, and then the actual shift right, illustrated in detail below. 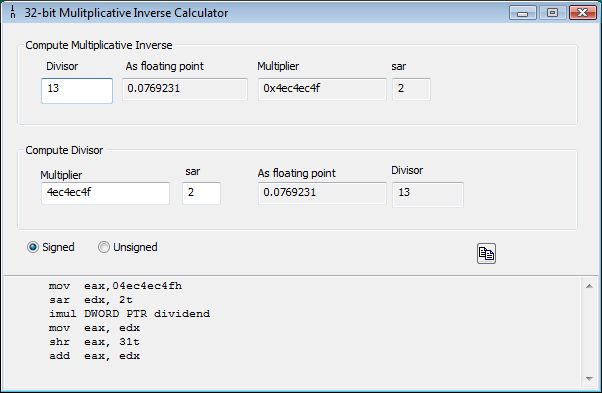 The source code for the Multiplicative Inverse Calculator can be downloaded. It is a Visual Studio 2008 project.